Einstein’s theory also predicts the existence of waves propagating in space-time as a result of the motion or collapse of massive objects. Are there ripples in space-time? 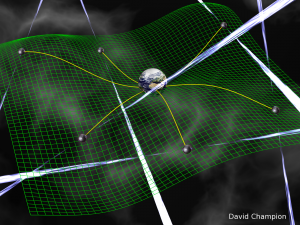 The existence of gravitational waves was confirmed about 30 years ago with radio pulsars. While this discovery, awarded with the Nobel Prize in 1993, showed the existence of gravitational waves due to the motion of stellar-sized objects, we expect to find gravitational waves on a much greater, cosmic scale. Both the birth of the Universe in the Big Bang and the collision of super-massive black holes in the centre of galaxies much later would be expected to produce gravitational waves that still propagate through our neighbourhood. The accurate pulsar clocks, together termed a pulsar timing array (PTA), in combination with the SKA telescope, will provide us with a unique opportunity to find these elusive gravitational waves at wavelengths that no other planned instruments will be able to detect. Pulsars forming the arms of a cosmic gravitational wave detector, or pulsar timing array.